• Alcohol energy drinks such as Four Loko are marketed to look like nonalcoholic energy drinks. • Alcohol energy drinks are popular with college students because one can contains the equivalent of five alcoholic beverages and one shot of espresso for an average cost of $2.50. • Nationally, there have been approximately 30 students hospitalized due to alcohol poisoning linked to the consumption of alcoholic energy drinks. 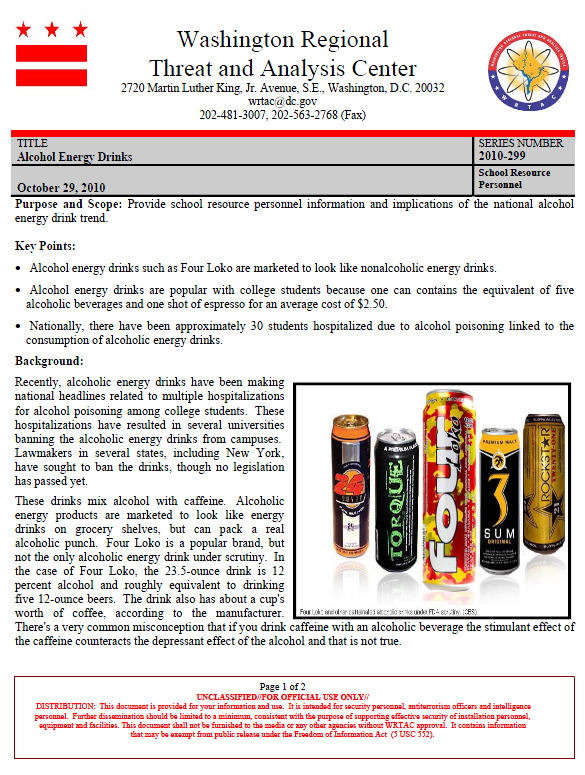 Recently, alcoholic energy drinks have been making national headlines related to multiple hospitalizations for alcohol poisoning among college students. These hospitalizations have resulted in several universities banning the alcoholic energy drinks from campuses. Lawmakers in several states, including New York, have sought to ban the drinks, though no legislation has passed yet. These drinks mix alcohol with caffeine. Alcoholic energy products are marketed to look like energy drinks on grocery shelves, but can pack a real alcoholic punch. Four Loko is a popular brand, but not the only alcoholic energy drink under scrutiny. In the case of Four Loko, the 23.5-ounce drink is 12 percent alcohol and roughly equivalent to drinking five 12-ounce beers. The drink also has about a cup’s worth of coffee, according to the manufacturer. There’s a very common misconception that if you drink caffeine with an alcoholic beverage the stimulant effect of the caffeine counteracts the depressant effect of the alcohol and that is not true. Binge Drinking: Statistics from the CDC show that roughly 90 percent of alcohol consumed by people under the age of 21 in the U.S. is in the form of binge drinking. Binge drinking is defined as a pattern of drinking that brings a person’s blood alcohol concentration to .08 or above, which is typically equivalent to five or more drinks for men and four or more drinks for women within the span of two hours. Alcohol Poisoning: Alcohol poisoning is one of the greatest dangers of binge drinking. It is a serious condition resulting from too high a concentration of alcohol in the blood. Symptoms include severe vomiting, depressed respirations, and seizures. It can result in coma and even death. Alcohol poisoning requires medical attention and often requires hospitalization in order to stabilize and monitor the patient. • Reduce access to alcohol on college campus by having fewer stores selling alcohol nearby. • Education by high schools and colleges about the dangers of binge drinking. • Physician screening, counseling, and referral for treatment of alcohol problems.